After working on the Handprint Owls, I thought it would be fun to try a different handprint craft. It couldn't be simpler. I traced our hands on colorful patterned paper, cut them out, added a white cardstock cuff to each, inked the edges, and layered them onto a sheet of light blue cardstock. Then I cut out a heart and handwrote in our name and the date. I liked the way it turned out and thought my sister might enjoy one with her family's handprints on it. For more than a decade, they've been hoping to become a family of four. 2013 will always be a special year for all of us who have been praying along with them for the baby they've wanted so desperately. Rather than work with a cardstock background, I painted a canvas light blue and then added white snowflakes. I traced and cut out the handprints, including Allison's darling little yellow ones. Arranging them was a bit tricky, as Kari and Timothy's hands are almost exactly the same size. It took a bit of maneuvering to make them both show and not look odd. 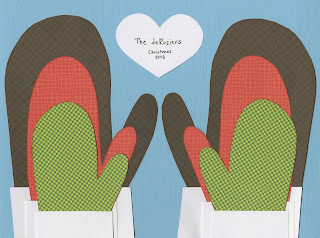 Brian's hands were too big to both fit on a single piece of paper, so I had to creatively piece the right mitten together. Once they were arranged and I adhered them to the canvas, it was time to make the heart. Rather than handwriting their name and the date, I printed it and then cut out the heart around it. I wish I had thought to make one during Trevor's first Christmas! 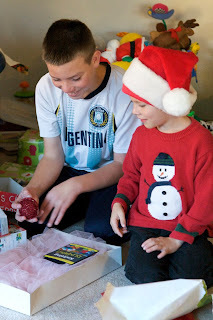 When my 13-year old nephew Timothy opened his Christmas present, this is what he saw. Knitting needles, a ball of yarn, and "Knitting for Dummies," all on a bed of pink tulle. Just what every 13-year old boy wants! But things are not always as they appear. The gift is actually hiding cash. I started by folding dollar bills into small rectangles. Then I started wrapping yarn around them. When one bill was covered, I added another bill, trying to maintain a round shape as I wound. After about 10 minutes of winding and shaping, I ended up with a perfect sphere containing $20 in cash. And the knitting book? It's actually a card with a pocket holding more cash. I simply scored and folded a piece of black cardstock, added a pocket on the inside, and adhered a printed image of a book cover to the front. I had a blast putting this gift together and even more fun watching him open it. His reaction was just like I'd hoped. It must have taken him at least five minutes to unwind the yarn and get his cash, with a huge grin the whole time. Success! Now that the recipients have their gifts, I can begin sharing some of the homemade gifts I made! First up, a second version of a Dollar Bill Dispenser. I chose cash. The Dollar Bill Dispenser I gave Courteney for her birthday was such a hit that I decided each of the four boys would be getting a Dollar Bill Dispenser of his own. I went to the bank and got a bundle of ones. 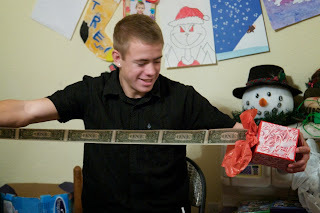 I made my cousin's son Ryan a red Dollar Bill Dispenser that was similar to the purple one that went to Courteney. I thought I took a picture of it before mailing it off to Spokane, but apparently I did not. For my sister-in-law's two boys, Ian and Sean, I decided to try a different style of Dispenser. I started by painting two empty square Kleenex boxes with a coat of gesso. When that was dry, I painted one box black and the other red. While they were drying, I started taping dollar bills together, end to end. Then I rolled them up. I rubbed-banded the two bundles and set them aside. Next, I covered the sides of each box with Christmas-themed patterned paper. I pushed one square of tissue paper down into the box and fluffed it to cover the top of the box. Then I stamped the word PULL onto a piece of white cardstock, used a border punch on the end, and taped it to the roll of dollars. I placed the roll down into the Kleenex box with the PULL tab protruding out of the tissue paper. Here's the candy cane box for Sean. And here is the snowman box for Ian. They were a hit. Both were a bit nervous to pull the tab, thinking it was going to explode or something. Once money came out, they kept pulling and pulling and pulling. I was really happy that this design worked as well as the cardboard tube style. On Monday I'll share the way I gave cash to my nephew Timothy. I had a LOT of fun putting it together and couldn't wait to see him unwrap it. This was Month 10 of Project 41 and I'm loving it just as much as I did at the beginning. I highly recommend that everyone stretch out their birthday celebration to last an entire year! I also highly recommend actively seeking out friends you haven't seen in awhile or you don't normally see one-on-one and treating them to ice cream. It's been a really awesome experience. After November's less-than-delicious ice cream, I was excited to see that December sounded amazing. December's flavor-of-the-month is Peppermint Bark in the Dark. It's described as "crunchy peppermint bark and creamy chocolate ice cream all wrapped together with a peppermint candy and white chocolate-flavored ribbon." Here's how it looked. It dripped on my hand while I was trying to take the picture. I wish they kept the ice cream just a degree or two colder at this particular Baskin-Robbins so that I'd have more than 5 seconds to snap a picture before it starts to drip. I'm happy to report that Peppermint Bark in the Dark was as delicious as I'd hoped! I'd definitely have it again, no question. I've been keeping a mental list in my mind of how I'd rank the flavors-of-the-month and this one is definitely near the top. This month's companion was my good friend / former dance partner / Trevor's godfather, Larry. 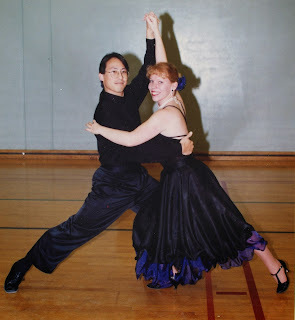 I met Larry through ballroom dance sometime around 1996. 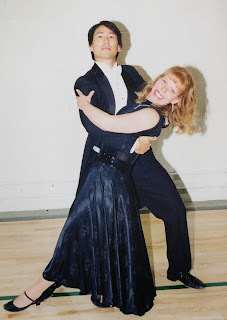 We danced together socially often, but the first time we were partnered for a routine was in 1999 for a tango. Here we are during a dress rehearsal in a gym. He we are in 2001, partnered for a waltz routine. Again, this is a dress rehearsal in a gym. I've misplaced all the proper portraits from my dance years. I've torn the house apart at least five times looking for them and it's making me crazy. I have my albums with all the snapshots, but I'm missing all of the portraits with each of my partners over the 11 years I danced. I know I promised months and months ago to blog about my dance days and I keep waiting to find the photos. I might need to just break down and just use snapshots to tell the story. Anyway, Larry and I had a great time eating ice cream and catching up. We see each other every few months, which is not nearly enough. The time flew by. Merry Christmas! Regardless of how (or if) you celebrate, I hope your day is filled with love, peace and joy. 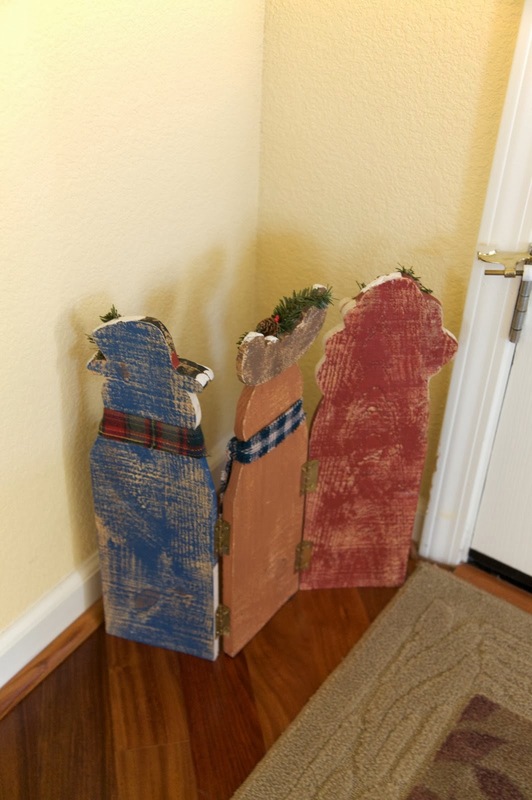 Today I'm sharing a craft that has special meaning in my family, a simple Nativity banner. First, a bit of background. My mom is a preschool teacher at the same Lutheran preschool I attended 38 years ago. (Technically, she's retired, but she subs often enough that it's fair to use the present tense instead of the past tense.) Every student who has gone through that preschool has made this same banner of burlap and felt. The one I made in 1975 and the one my sister made in 1978 have hung in my parents' house every single Christmas since we made them. Starting when I was about 10, each year I helped my mom cut dozens of Marys, Josephs, cradles, and stars from different colors of felt so that her students could make their banners. In 2003, my sister's son started at that preschool and came home with his own Nativity banner. Since we do not live in my hometown, Trevor did not attend that same preschool. His school did other wonderful projects, but not the Nativity banner that his mom, aunt, and cousin had all made when they were in preschool. So my mom brought the supplies to our house that Christmas in 2009 and Trevor made a banner. It hangs in our house each Christmas season, a reminder not only of Jesus' birth, but of the importance of family and tradition. I'm a bit obsessed with scavenger hunts. 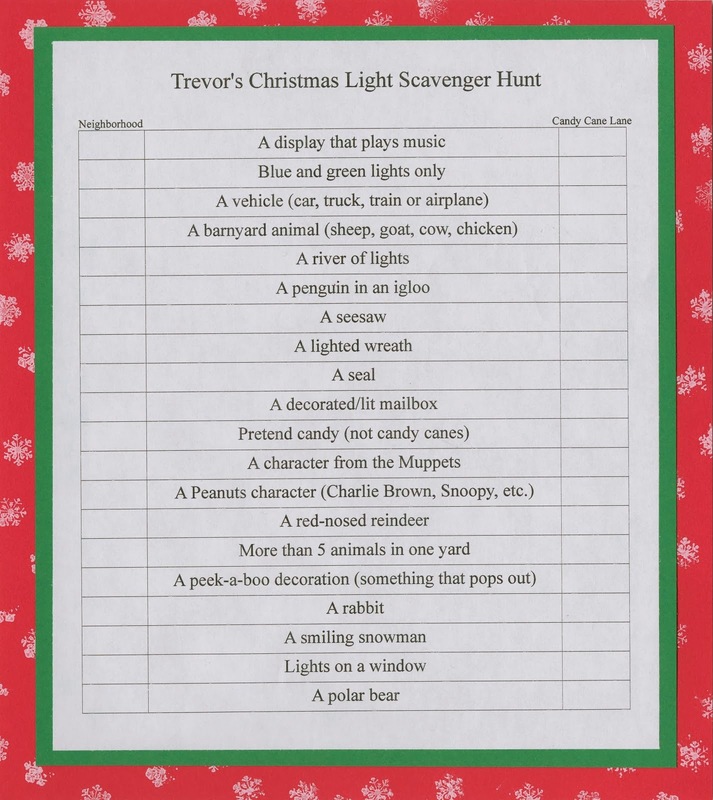 So when I saw this Christmas Light Scavenger Hunt, I immediately printed it out for us to do. I put the list on a clipboard, attached a red pen, and we headed out for a walk through our neighborhood. 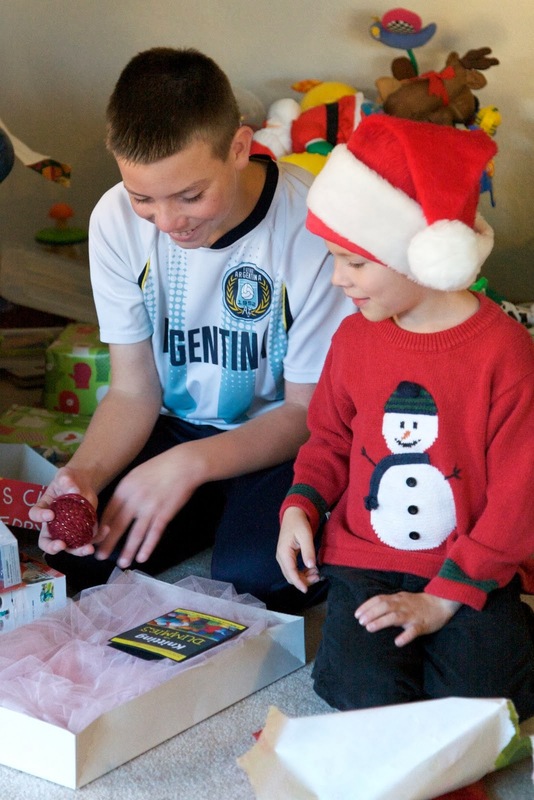 Each time we got to a decorated house, Trevor would search through the decorations for items on the list to scratch off. Steve helped out by shining a flashlight on the list. After walking up and down every street, we managed to check 12 items off the list of 20. Not too bad, I guess. A few days later, we took the same list to visit Candy Cane Lane, a neighborhood where all the residents go all out in decorating their houses. At each house, Trevor would carefully check the list and check off an item, this time with a green pen. In no time, we had 18 of the 20 items checked off the list. Two remained elusive: a gingerbread house decoration and someone outside fixing lights. After passing every single house, we returned to where our car was parked. As we buckled in, the owner of the house we were parked in front of drove up, got out of his car, and without even putting down his briefcase, he went straight over to fix a small section of lights that were out! We all cheered. It was surprisingly exciting to scratch it off the list. 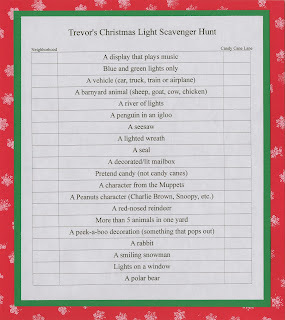 We had such a great time with the Christmas Light Scavenger Hunt that Trevor decided to make his own for next year. I helped him create a document with a list of 20 items in the center and places to check off whether we found each in our neighborhood and/or at Candy Cane Lane. Here is his finished Christmas Light Scavenger Hunt. Some of the items are going to be difficult, but that's half the fun. I'm already looking forward to Christmas 2014! On the last day before winter break, Trevor's 2nd grade class spent the morning rotating through really fun holiday-themed stations. I was in charge of the table where they made ornaments out of dog bones. I had a great time and the kids did too. I'm so glad Trevor's teacher works art and crafting into the curriculum as often as she does. It makes me really, really sad when I hear about classrooms that don't do anything creative or artistic. To make the ornament, each child chose one dog bone, two felt ears, two googly eyes, one pom pom nose, and holly leaves and berries. The directions were simple: choose whether you want the words showing on the milk bone or not, then use hot glue to attach the ears, eyes, nose, and holly leaves and berries. When the ornament was assembled, each child glued a loop of ribbon to the back to create a hanger. Here's Trevor with his finished ornament. I didn't expect there to be all that much variety from ornament to ornament, as there aren't that many different ways to assemble eyes, a nose, and ears. But the kids surprised me. Each ornament was completely different from the next. It was so fun to see their creativity shine through. Here are some of the finished ornaments. What a blessing to be in a classroom where creativity is encouraged and individuality is valued. For the last several years, Trevor and I have spent December 26th making thank-you cards for him to send to friends and family. (Here's last year's card.) As much as I love making cards and crafting with Trevor, it is hard to push aside everything else on the day after Christmas to not only write thank-you notes but to make the cards first. Which is why this year, we made his thank-you cards well in advance. We began by gathering our materials: white cardstock, white card blanks, brown paint, googly eyes, red sequins, and green washi tape. I helped him cut the white cardstock into rectangles that were slightly smaller than the card blanks. Then we used a foam brush to paint Trevor's palm and his index and ring finger brown. He stamped it on a piece of cardstock and repeated the process until there were enough. He washed and dried his hands, then we painted part of the side of each pinkie (see picture below) to add antlers to the reindeer. We added more paint to his finger each time he stamped. Trevor finished stamping and ran to wash his hands before I could get a picture of his painted fingers. He absolutely hates being messy and can't stand paint on his skin. I painted one of my own pinkies for the sake of the tutorial. 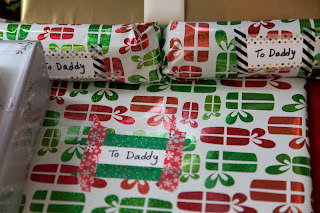 Once the paint was dry, Trevor used Christmas washi tape to wrap the edges of the card fronts. 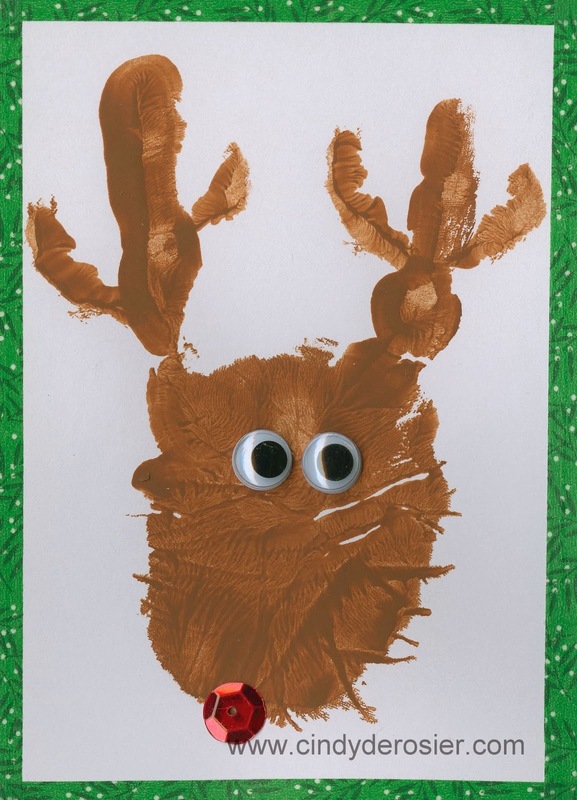 Next, he added googly eyes and a red sequin nose to each reindeer. They turned out so well and each was slightly different. This was his favorite. He attached it to a card base and then set it aside to save and enter in the fair next summer. On December 26, Trevor will write his thank-you notes and then attach these card fronts to the note cards. I have a feeling that everyone will love them. We decided to make another garland with paper that hopefully will not fade as easily as construction paper. I dug through the craft closet and found this "Reflections Paper." It has a mirror finish that would be beautiful as lightbulbs. 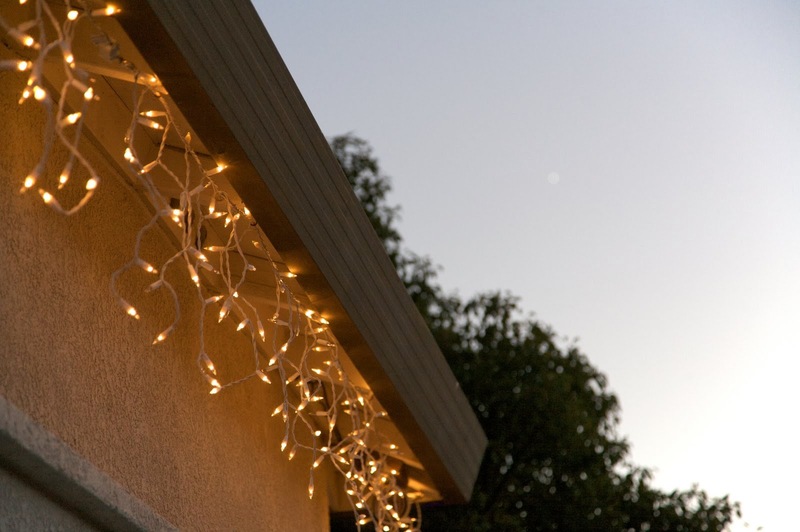 Making the garland was simple. We made a freehand template on chipboard, cut it out, then used it as a tracer to create matching lightbulbs. Then we cut 4"x2" strips of black cardstock and folded them in half. We cut a length of black yarn and spaced the black cardstock strips evenly along the yarn, with the open end hanging down. We applied glue to the bottom edge of the front and back, and inserted a bulb into each black cardstock piece. When the garland was dry, we strung it from the staircase over the piano. I'll be curious to see how fade-resistant this paper is. Hopefully it will stay bright and colorful. But if not, we'll be remaking this with felt in a future year. I'm stuffing these full of little trinkets and adding them to their Christmas gifts. I hope they like them! Trevor was back to 100% on Tuesday the 10th and went to school. On the evening of the 11th, Trevor's eyes both swelled shut and he could not see at all. It was terrifying, both for him and for me. 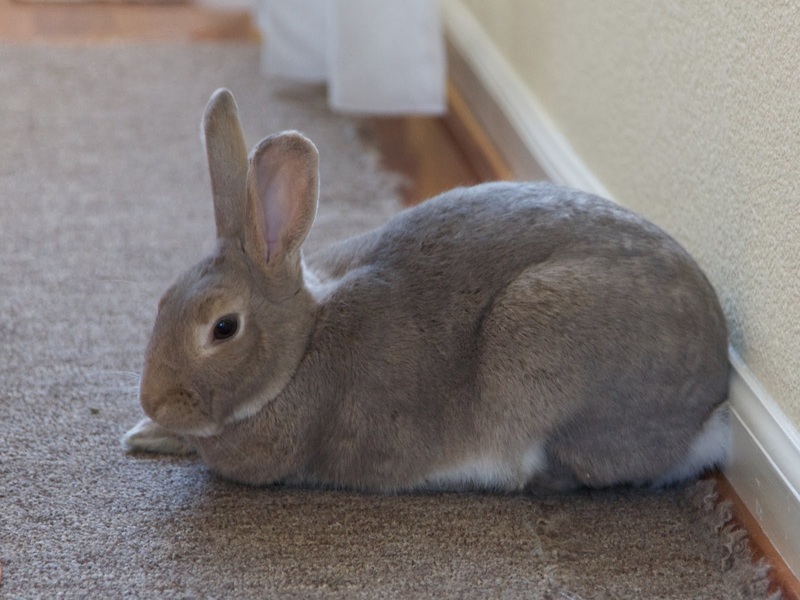 We treated it as an allergic reaction, though it turned out to be a severe bacterial infection in both eyes. By Thursday morning, with compresses applied, he was able to open his eyes enough to see a tiny sliver of the area by his feet. In order to see straight ahead, he needed to point his face toward the ceiling. Here he is at the doctor's office on Thursday the 12th with his eyes opened as wide as possible. 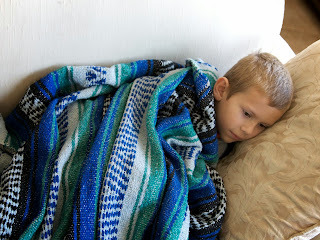 With antibiotics, compresses, and lots of rest, he was able to resume activities yesterday, thank goodness. 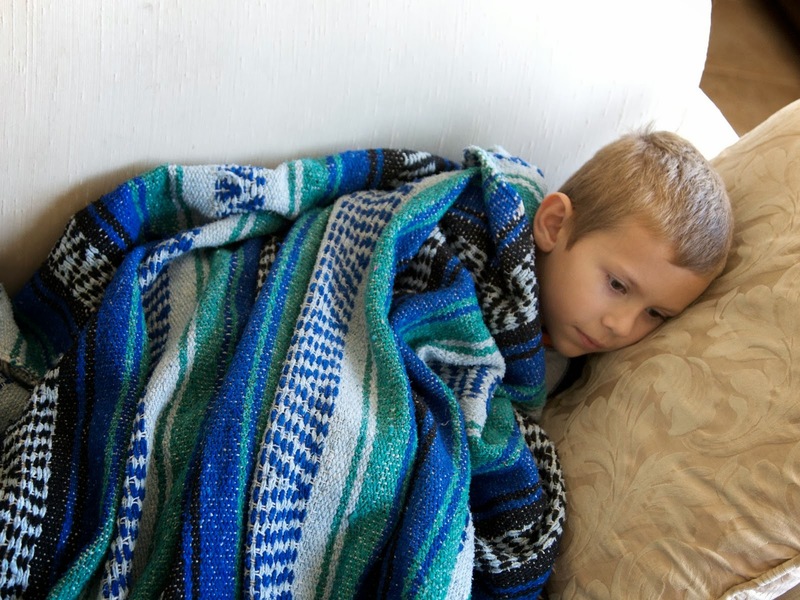 It is horrible when your child is sick, particularly when he couldn't do any of the typical sick-kid activities that require vision. He couldn't see the TV, he couldn't read, he couldn't play games, he couldn't do anything on his own. We had to miss multiple parties and other activities that we had been looking forward to attending. I spent a lot of time reading out loud to him. Unfortunately, I got a bad cold (as well as a mild infection in one eye) right as Trevor was improving from his own cold and eye infections. Obviously, we also didn't do any crafting while Trevor's vision was compromised or when I was under the weather. 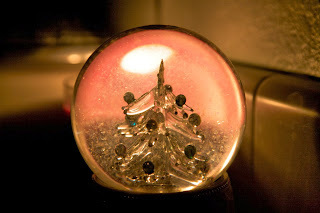 All of the projects that have been running on my blog this past week were prescheduled. The projects we'd planned to do didn't happen. Now that we're both healthy, we're working furiously to finish our handmade Christmas gifts. I'm going to share one of those tomorrow. In the meantime, I wanted to share a project I finished awhile ago and finally delivered. Remember the Handprint Owl canvas I'd made back in February? I showed it to my sister on the day her baby was born, with the promise to handprint her two kids and make her a canvas. It ended up taking awhile to get the handprints done, due to a combination of me not seeing them all that often and my niece being extremely uncooperative about having her tiny, wiggly, clenched hand painted and pressed onto canvas. 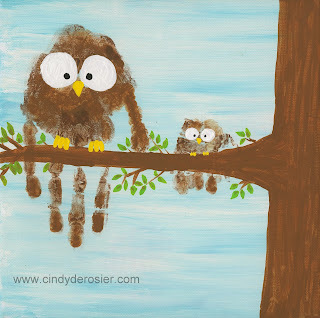 Then it took a very long time for me to finally paint in the details to turn two handprints into two owls. And then, it took another long time for me to see my sister somewhere that didn't involve travel and the nuisance of packing a canvas into luggage. But now she finally has her canvas so I can finally share it. Here are the handprints of then-12 year old Timothy and 1 month-old Allison. In retrospect, I would have had Timothy put his hand closer to the center. Because his hand was so far to one side, I couldn't put the tree trunk next to it. But I'm happy with how it turned out and so is she. I have another handprint art project in the works that involves my sister's family... more on that after Christmas! Photo-a-Day challenges are awesome. They're lots of fun and such a great way to spark ideas for creative photography. 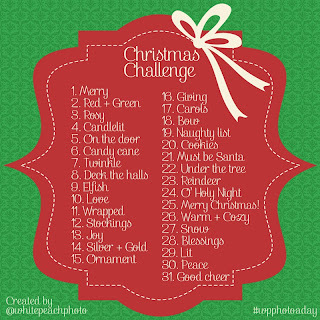 When someone posted this Christmas Challenge list at Scrapjazz at the beginning of December, I knew I wanted to play along... and that I wanted Steve and Trevor to play along too. But rather than complete the list as a Photo-a-Day, I decided to treat it as a Photo Scavenger Hunt. (As you know, I love any type of Scavenger Hunt.) I printed out the list and set it aside. Fast forward to the weekend of Dec. 6/7. Trevor woke up with a fever and had to miss several events he had been looking forward to attending, including a gingerbread decorating party. He was really disappointed. After a handful of pictures, Trevor was back on the couch resting. Over the course of the day, he ended up taking 20 pictures out of the 31 prompts. It was a fun activity for him and he enjoyed watching from the couch to see the pictures that Steve and I took, even if he wasn't up to taking them all himself. And here are some of my favorites from the ones I took. Between the three of us, we took a total of 82 pictures based on the prompts (plus a bunch of other random ones). 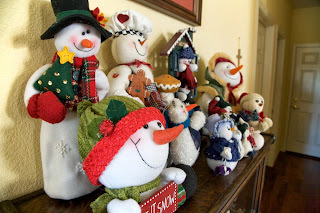 I'm planning to use the best of them on a layout about how we decorate the house for Christmas. Have you done a Photo-a-Day Challenge, either the way it was intended or all at once like a Photo Scavenger Hunt? If not, I'd encourage you to give it a try! It's a great activity to do alone or as a family.